Thanks to his speedy pigeon, Hebberecht will win a trophy from His Majesty the King and a cash prize of ?22,000 (Bt1.02 million). The first and second runners-up will get a trophy from Her Majesty the Queen and HRH Princess Maha Chakri Sirindhorn and cash prizes of ?10,000 and ?5,000 respectively. “We released 708 pigeons in the morning,” says Taweechai Techawichian, chairperson of the organising committee. Birds registered in the race have owners from Belgium, the Netherlands, Romania, Britain, Switzerland and, of course, Thailand. Taweechai says the pigeons had been kept in one large cage and trained in Thailand since early this year. The Chiang Mai-Bangkok route was the final leg of their journey. Each arrival time was recorded by a computer linked to a microchip implanted in the bixrd. Before the final leg, the pigeons had flown races from Nakhon Sawan, Phichit and Uttaradit. The distance for these routes is 230, 300 and 430 kilometres long respectively. The winners in the hotspot races also received some prizes. “This is a colourful activity and should help boost the country’s tourism,” deputy governor of Chiang Mai Chuchart Keelapaeng says. He was part of the pigeon releasing ceremony yesterday morning. 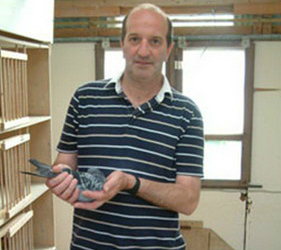 Initially, 1,666 pigeons were entered in the race, but many disappeared during training or did not return after racing. “Some birds got lost. Others fell ill during the long haul because of changes in weather conditions, while some will have fallen prey to predators,” Taweechai explains. 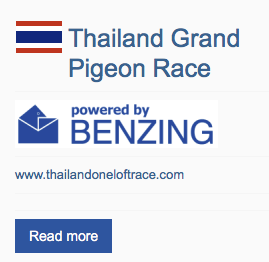 The race was jointly organised by Thailand’s Racing Pigeon Federation, the Grand Pet Show and Friendship Associations.